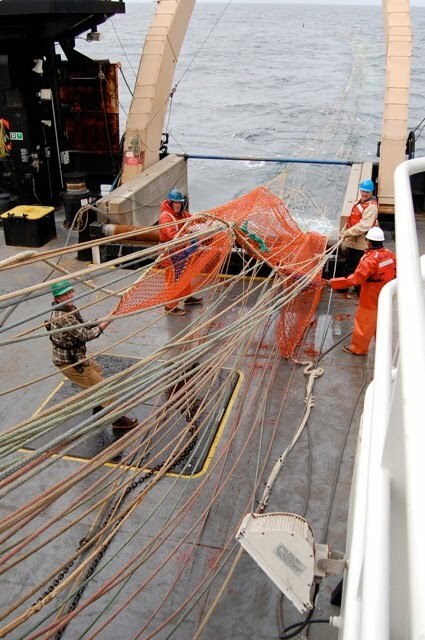 One of the objectives of the scientists on the BASIS cruise is to support Alaskan fisheries’ efforts to better understand the life histories of the local salmon populations. The goal is to determine an index to better forecast the juvenile salmon’s return to western Alaska. Thus management decisions may be made with a better understanding of long-term as well as short-term implications. So to understand the science behind this, this chemistry teacher from the northeast had to first learn a bit about salmon…. Top fish are a juvenile Chum and juvenile Red. Bottom is an immature Chum. Salmon are anadromous fish. This simply means, while they spend most of their lives at sea in marine waters, they can and will return to fresh waters of lakes, streams and rivers to spawn. The most tenuous part (in terms of environmental and human impact to the general population) of a salmon’s life seems to be in its juvenile stage (1st year in the ocean). Environmental conditions, availability of food and loss to bycatch by fisheries all have impacted the salmon populations as a whole. Our short term mission here on the Oscar Dyson is to collect data from the salmon caught during our trawls. Below is a bit more about the specific data the scientists hope to collect and the issues behind the science of that data. Remember that the scientists hope to establish an index to forecast the juvenile salmon’s return to western Alaska’s spawning grounds. This index is based on relative abundance and a fitness index. So what is a fitness index for a fish?? (I asked too..) It’s simply the caloric content of the fish. Making a chemistry teacher happy with yet another example of the usefulness of calorimetry. Yes, folk.. they burn the fish and measure how much energy is released, just like we do in class except not with a soda can. The fish are frozen for this analysis and brought back to the lab for bomb calorimetry analysis. The growth of a salmon depends much on its diet. Scientists have observed a shift in the diet of the salmon when there is a shift in zooplankton populations. During warmer years a more stable water column develops with a pronounced thermocline. [Really warm (about 10 degrees Celsius or so) on top and really cold on bottom (close to 0 degrees Celsius)] Associated with this type of water column are the presence of zooplankton with a smaller lipid content (less fat). 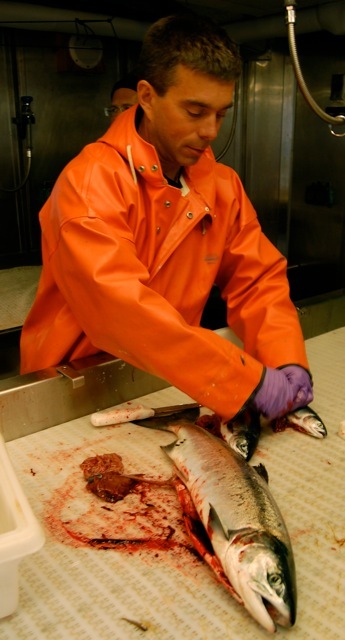 As a result, the salmon (specifically the Sockeye) were observed to be eating pollock during warmer years. Normally, the majority of the salmon diet is zooplankton. During colder years, a less stable water column develops and zooplankton with a higher fat content were observed to be the main diet of the juveniles. 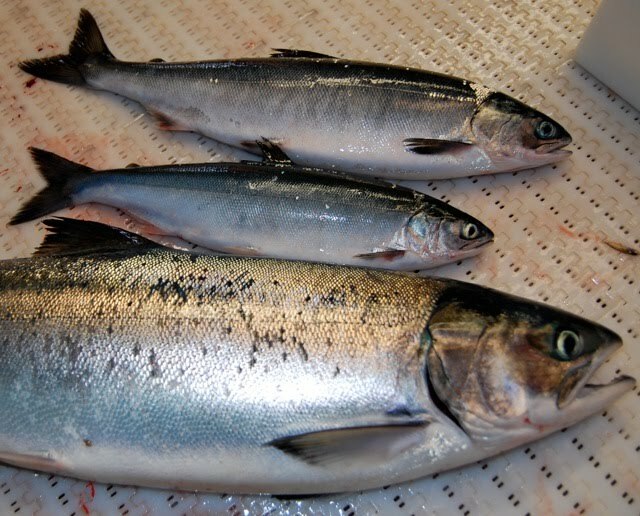 This link between the salmon and pollock populations causes an uncertainty in forecasting future salmon population changes. The impact of the pollock fisheries has been mostly documented in the past simply in terms of bycatch. 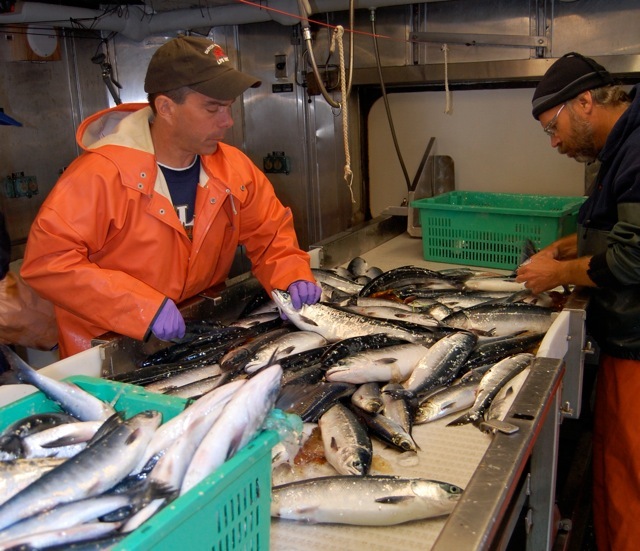 Summer pollock fishing often results in bycatch of Chums; whereas the winter pollock season impacts the Chinook. Understanding this newer biological relationship between salmon and pollock is important to predicting how changes in pollock populations will ultimately impact the future of salmon. This future causes great concern among the local northern native groupswho rely on the Chinook’s population as a major food source. 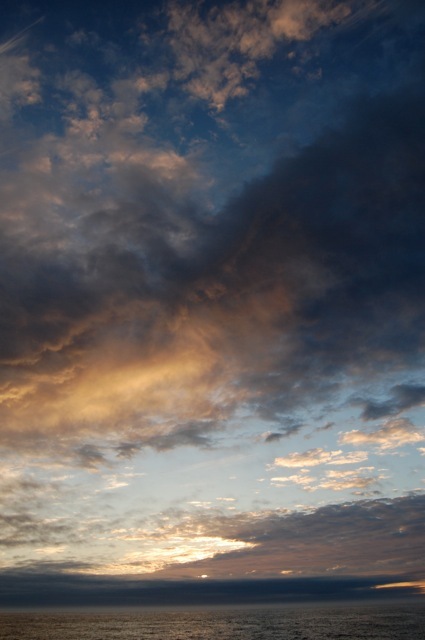 We were treated Thursday evening with some blue sky and then on Friday morning to a beautiful sunrise with a view of the mountains of Unimak Island. When grey is a common daily theme any color is appreciated oh so more.. 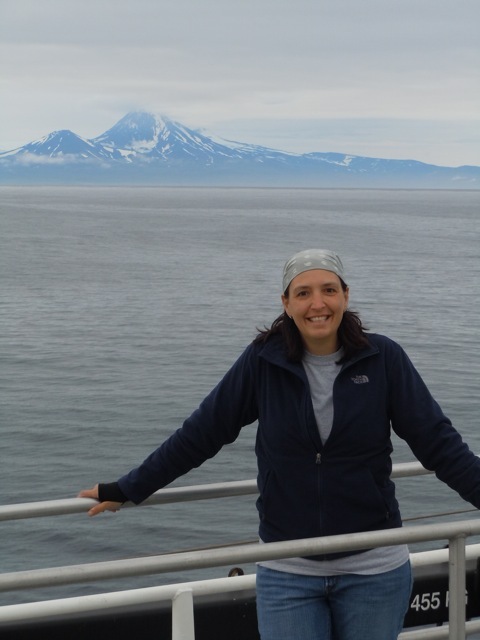 This entry was posted in 2010, Natalie Macke, NOAA Teacher at Sea and tagged Alaska, anadromous fish, BASIS, Bering Sea, byCatch, chum salmon, Coho salmon, King Salmon, Oscar Dyson, sockeye salmon. Bookmark the permalink.